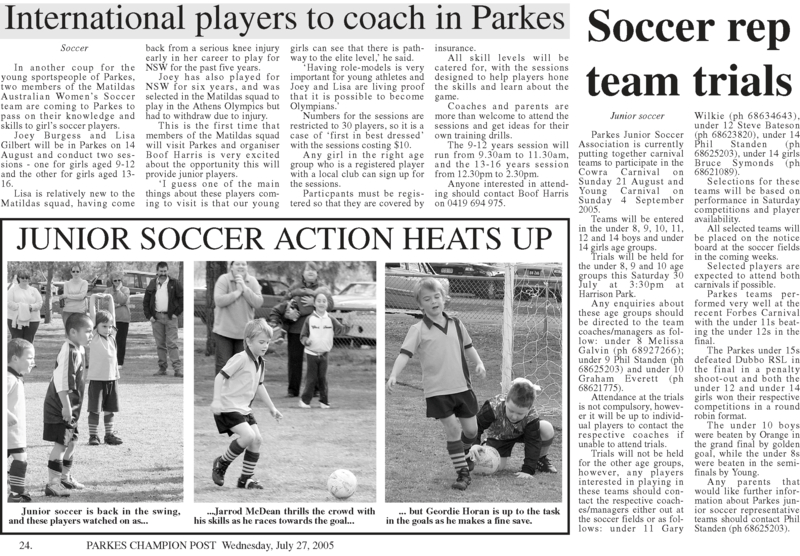 Two members of 2005 Australian Women’s Soccer team (aka The Matildas) attended a coaching clinic for local players. Joey Burgess was part of the Matildas squad for the 2007 Women’s World Cup, getting game time against Norway, Canada and Brazil (Source FIFA website). 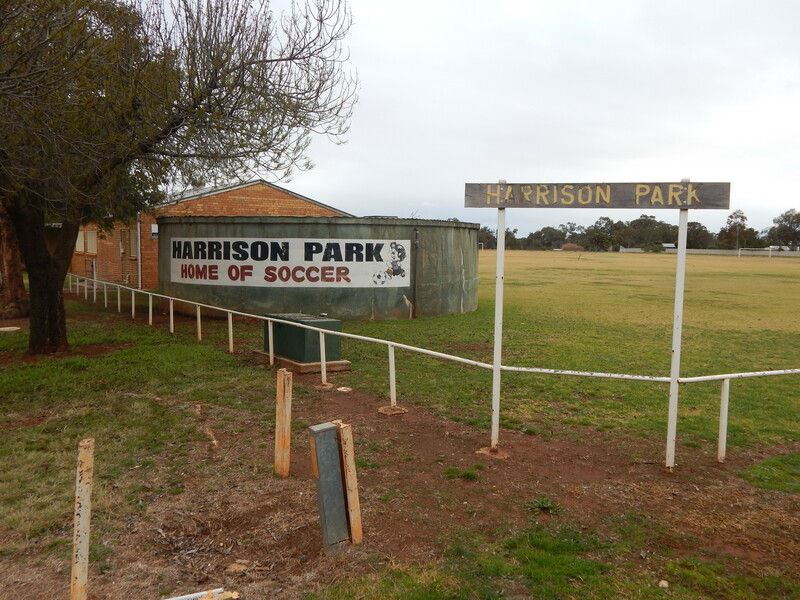 In addition to soccer and cricket, Harrison Park is the starting point for the Annual Rotary Fun Run and on the ANZAC Day Public Holiday is the venue for Parkes Baptist Church’s family picnic. Ronald Francis Arthur Harrison worked tireslessly for the community, especially in the area of sports administration. 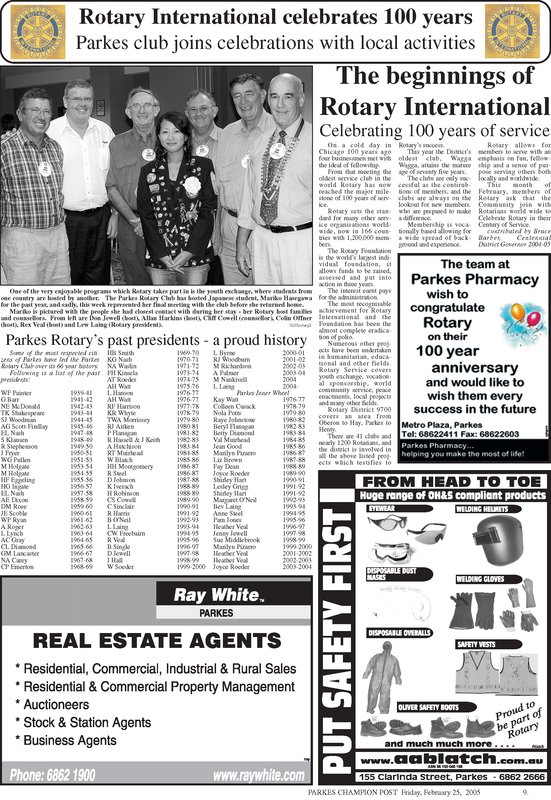 Ron was president of Parkes Rugby League club, and was also president of Group 11 in the Country Rugby League. In addition he also was inaugural principal of Parkes College of TAFE – remaining in that position from 1964 until 1984. 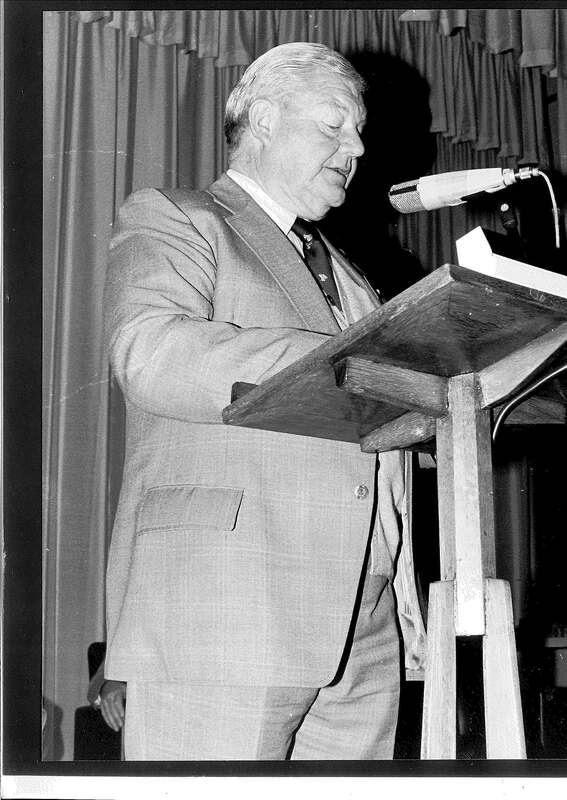 Ron Harrison was a Rotarian, serving as president from 1977-1978. A keen fisherman, it was while on a fishing holiday in Dorrigo that Ron Harrison suddenly suffered a heart attack. Ron’s wife, Margaret, and his two daughters, Jeanette MacGregor and Kristine Nock all still reside in Parkes. Ron’s son, Robert, moved away to live in Port Macquarie where he still resides today. 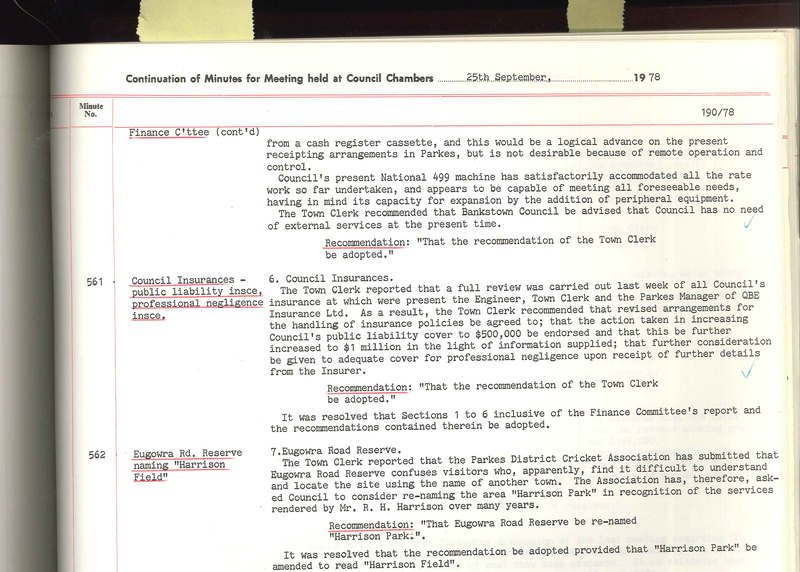 Jeanette MacGregor, one of Ron Harrison’s daughters, stated to Parkes Library that in addition to Harrison Park, the training/warm up field near the Spacemen’s home ground (Pioneer Oval) is called Croaker Park. This is a reference to Ron Harrison’s nickname of “Croaker” due to his croaky voice. This means that Ron Harrison has the rare distinction of having two sporting fields named in his honour. Councillor Michael Greenwood remembers Ron Harrison with great affection. Together the two worked tirelessly on the Parkes Sports Council, which has been responsible for maintaining and upgrading the fantastic sporting facilities that the Parkes shire enjoys today. 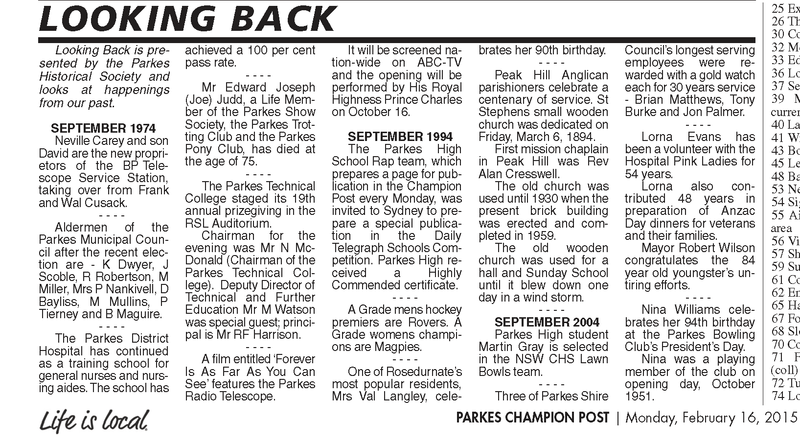 Ron Harrison was chairman of the Parkes Sports Council up until his death in 1985. 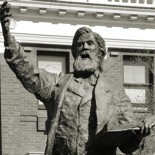 * at the time of his death, chairman of the Parkes Bi-centenary Committee. 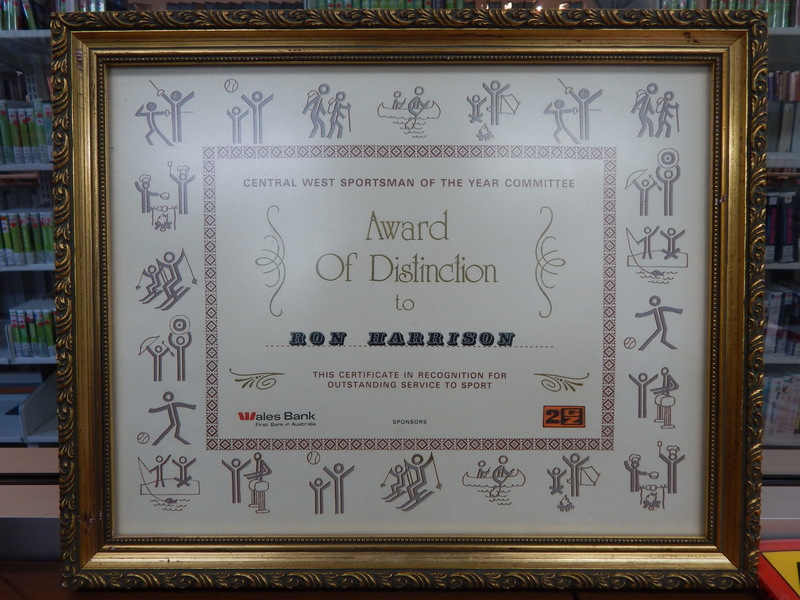 Ron Harrison was recognised for his enormous contribution to sports administration. Photographed by Dan Fredericks from Jeanette MacGregor’s collection. The annual Rotary Fun Run, which commences at Harrison Park and finishes at Northparkes Oval, has seen Australian Olympic athletes participating with enthusiastic locals. 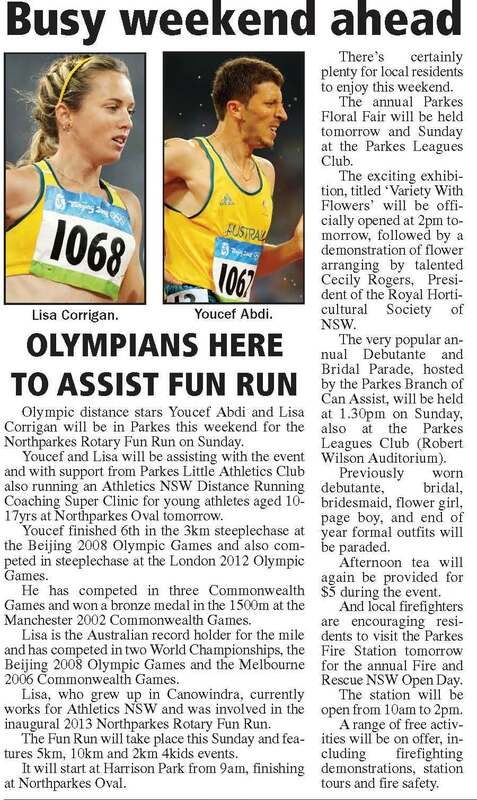 In 2014 the Rotary Fun Run had Lisa Corrigan and Youcef Abdi joining in. Parkes Shire Library would like to thank Jeanette MacGregor, Margaret Harrison and Councillor Michael Greenwood for their permission to share stories, documents and photographs relating to Ron Harrison, OAM. In addition we would like to thank the staff at Parkes Champion Post for allowing us access to their archives in researching this post. If you have stories or memories that happened on Harrison Park, please contact dan.fredericks@parkes.nsw.gov.au so that they can be shared. Alternatively you may leave comments on this page. Thanks Dan Good job. Well done. Jeanette Mac. This entry was posted on July 8, 2015 by parkeslibrary in cricket, football, General history, Matildas, Ron Harrison, Rotary Fun Run, soccer and tagged Eugowra Road Reserve, Harrison Park, Lisa Corrigan, Matildas, Parkes, Parkes Rotary, Ron Harrison, Ron Harrison Sports Bursary, sporting fields, Youcef Abdi.